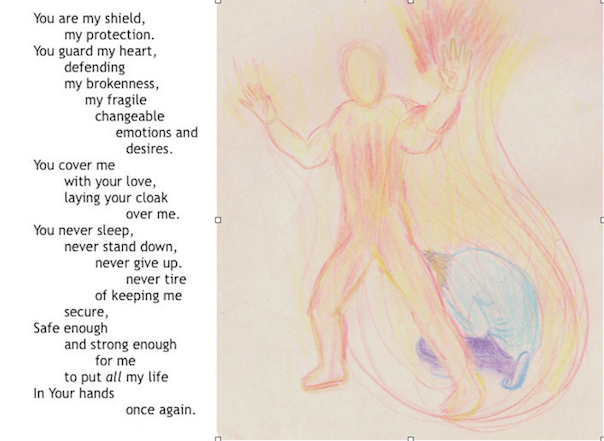 My drawings and poems are a way I pray. So I do not allow myself to erase, lest the goal become pride and perfection instead of honest communication with God. Look past my humanity to see God with me. 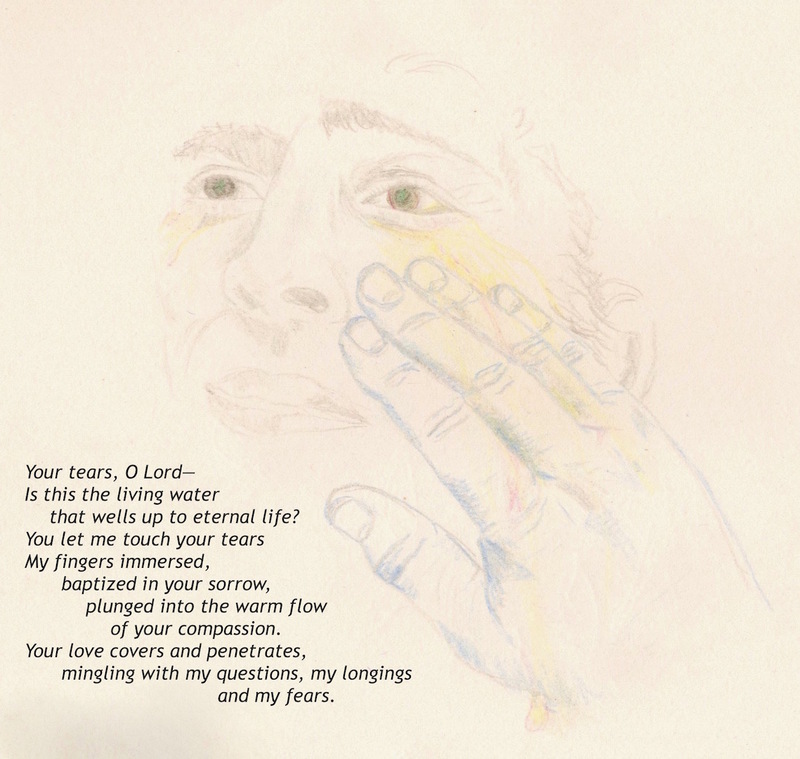 Praying with the Crucifixion at Christmas birthed this drawing and poem. Our Savior was born to die; took on flesh to free our spirits; and emptied himself of sovereignty to bear our shame and sorrow. According to G. K. Chesterton, “Christianity got over the difficulty of combining furious opposites by keeping them both, and keeping them both furious.” Yes. Only God could imagine this kind of solution. Christianity is all about forgiveness. Through the self-giving, self-emptying sacrifice of Jesus, we can receive God’s forgiveness. 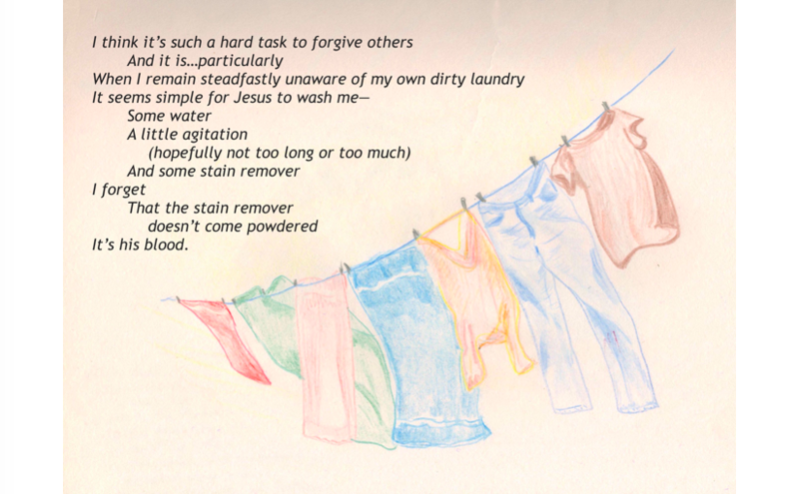 And like God, we are to offer forgiveness to others, at least 70 x 7 times (Mt 18:22). Jesus even teaches us a scary way to pray: “Forgive us our debts as we forgive our debtors” (Mt 6:12). Yet forgiving is so very HARD to do! Clearly, they don’t deserve our forgiveness, or there would be no insult, injury, or debt to forgive at all! And what if they have never apologized or are not even sorry for what they did? And what if they were sorry yet keep doing the same thing again and again? So, God, I choose forgiveness, whether I feel like it or not. I choose to forgive again and again. I choose to apologize to others. I choose to repent, confess, and receive your forgiveness. I want to love more. Looking back, I don’t remember her response. What I do remember is that I knew exactly how I was responding to Christ’s tears. I wanted to touch them. I wanted to touch the tears on his face. After she left, this image came to me, as did the poem. Yes, Jesus is the source of living water–flowing from his eyes and from his pierced side. I had been in unrelenting pain for months. Listening to Bethel Music’s song “It is Well” brought some peace: So let go, my soul, and trust in Him / The waves and wind still know His name. Yes, Lord, you are my shield. Only in You am I secure. Believing and receiving the unconditional, unearned love of God for me is terribly difficult sometimes. Earning God’s love seems safer, more controllable, more sure. After all, I hold myself to very high standards of not just acting right but being right; of not just acting in loving ways, but being loving. Why would God expect any less of me than I do of myself?! I am often not right, and I am often not loving. Why would God not be disappointed in my human imperfections? Why would God not love me less because I continue to sin? My husband tells me when he says I am beautiful, I roll my eyes. My husband tells me when he says he loves me, I wince. What is that? Do I do the same to God? When I think of receiving God’s unconditional, unearned love, I feel rising in me a “Yes, but…” Yes, God, You say I am beautiful in Your sight, but do You really see who I am? Yes, God, You say You love me, but do You really see my heart? Are you just loving who You hope I will someday become? Can You really, fully love me? Can You whole-heartedly, covenantally love me now? Already? 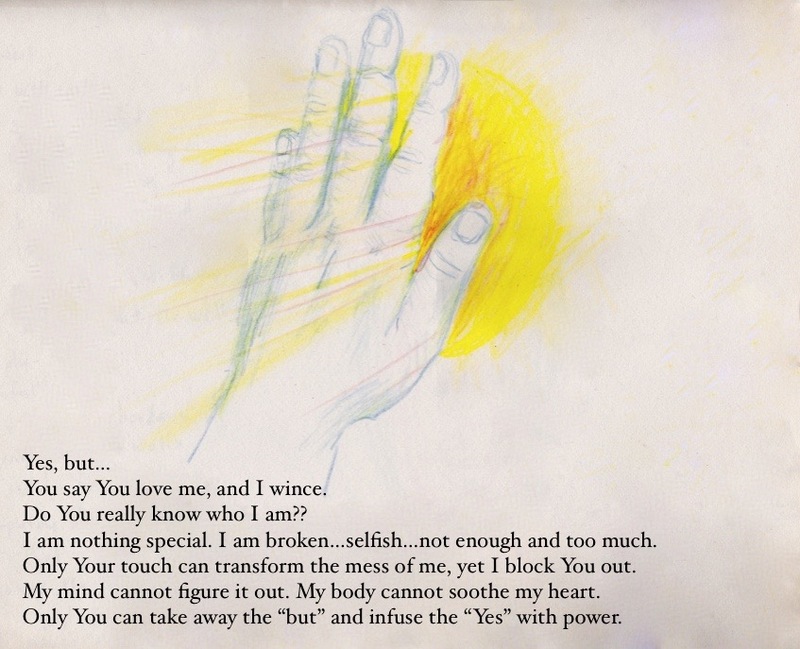 This sketch and poem flow from the “Yes, but” place in me, the place where I roll my eyes at You, God, and wince. I block Your love. I am afraid You will one day wake up and see that I am not beautiful and that I do not deserve Your perfect love. I am afraid that if I open my heart to receive Your love freely, I will be rejected and my shame will deepen. Sometimes I am afraid I am too much for You–too headstrong, too scattered and distractible, too talkative, too quiet. Sometimes I am afraid I am not enough for you–not worthy enough, not feminine enough, not lovable enough, not attentive enough, not trusting enough. Instead of blocking You out with my “Yes, but…,” I choose to receive Your love, God. I choose to offer You an unqualified, “Yes!” I choose to surrender to Your love. Please help me. Only You can take away the “but” and infuse the “Yes” with power.